What a beautiful warm weekend in the Bay Area. It was also a weekend of celebrations as one of my closest friends got married and my best friend celebrated a birthday. With temperatures in the 80’s, it was nice to go to the City and cool off a bit to the mid-70’s. My evening ended with dinner in the City. 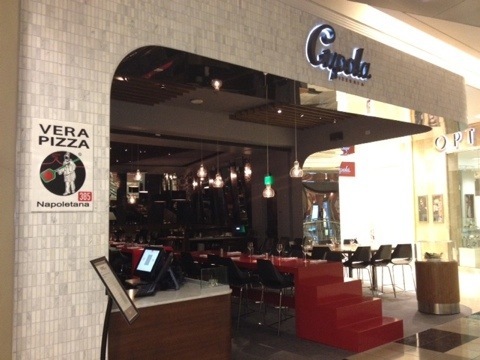 You wouldn’t think that Cupola Pizzeria is part of the Lark Creek Restaurant Group. The restaurant is located in the Westfield Mall in Downtown San Francisco. Cupola is one of my best friend’s favorite places to eat. According to Yelp, she is the Duchess of Cupola, meaning she has the most check-ins. This month is Cupola’s one year anniversary and I finally paid my first visit. I was with my sister and another friend. We decided to order family style with each of us choosing one item. I chose the Margherita extra which has buffalo mozzarella, San Marzano tomatoes, basil, and olive oil. We asked for this to come out first. The super thin, slightly charred neopolitan pizza was excellent. 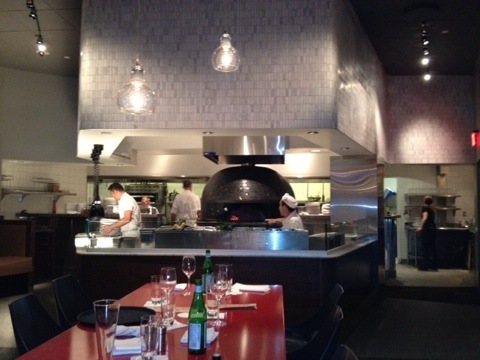 Like many other great pizza places, Cupola also cooks its pizza in a wood fire oven that was imported from Italy. Our two pasta dishes came out shortly after we inhaled our pizza. 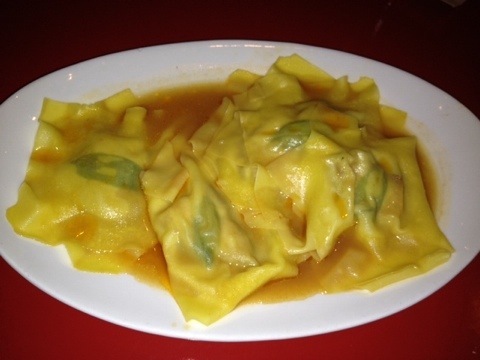 One pasta was the pork belly tortelli, with sage and braising jus. A slice of pork belly becomes the stuffing in their version of this pasta. 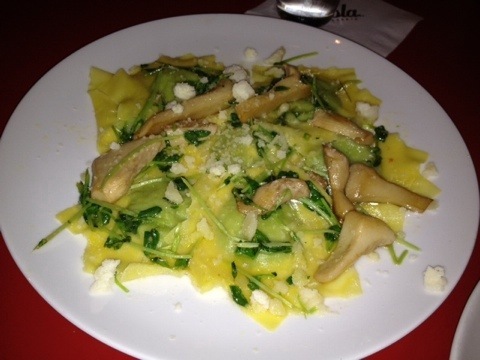 It was not until my second tortelli that I really appreciated this dish. I was able to notice the pork fat, the hand made pasta, and the delicious au jus. We agreed to share the Swanton Strawberries for dessert. 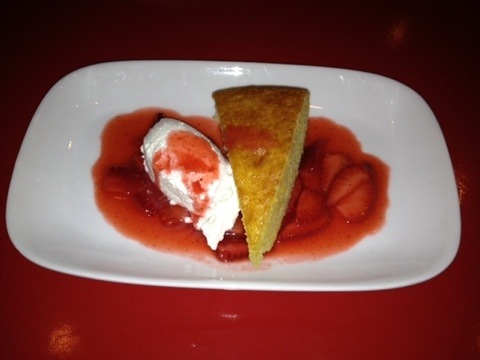 This was strawberries, grappa, olive oil cake, and whipped creme fraiche. The cake was a like having corn bread with the consistency of cake. It is a great summer offering. I don’t know why it took me a year to try Cupola, but it won’t be a year before I return. Happy Anniversary Cupola! I am so glad that you finally got to enjoy one of my favorites! I want to try the preset menu. Let’s go when I’m hungry. 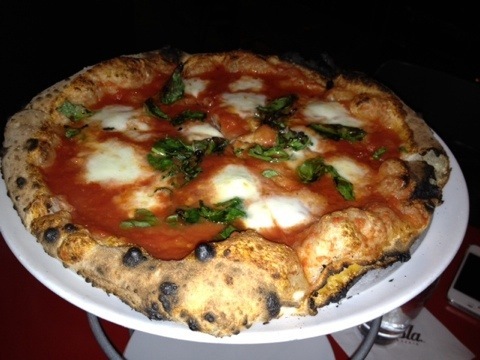 Have you tried Tony’s Pizza Napoletana and if so, how does that Margherita compare to yours? I went awhile back, but I don’t think I had it with buffalo mozarella. Its probably just as good and not as crowded.